This article is about the anti-Greek pogrom in Istanbul in 1955. For the anti-Greek activities that occurred in the same city in 1821, see Constantinople Massacre of 1821. The Istanbul pogrom, also known as the Istanbul riots or September events (Greek: Σεπτεμβριανά Septemvriana, "Events of September"; Turkish: 6–7 Eylül Olayları, "Events of September 6–7"), were organized mob attacks directed primarily at Istanbul's Greek minority on 6–7 September 1955. The riots were orchestrated by the Tactical Mobilization Group, the seat of Operation Gladio's Turkish branch; the Counter-Guerrilla, and National Security Service, the precursor of today's National Intelligence Organization. The events were triggered by the false news that the Turkish consulate in Thessaloniki, in northern Greece—the house where Mustafa Kemal Atatürk had been born in 1881—had been bombed the day before. A bomb planted by a Turkish usher at the consulate, who was later arrested and confessed, incited the events. The Turkish press, conveying the news in Turkey, was silent about the arrest and instead insinuated that Greeks had set off the bomb. The pogrom greatly accelerated emigration of ethnic Greeks from Turkey, and the Istanbul region in particular. The Greek population of Turkey declined from 119,822 persons in 1927, to about 7,000 in 1978. In Istanbul alone, the Greek population decreased from 65,108 to 49,081 between 1955 and 1960. The 2008 figures released by the Turkish Foreign Ministry placed the number of Turkish citizens of Greek descent at 3,000–4,000; while according to the Human Rights Watch (2006) their number was estimated to be 2,500. Some see the attacks as a continuation of a process of Turkification that started with the decline of the Ottoman Empire, rather than being a contemporary, bilateral issue. To back this claim they adduce the fact that roughly 40% of the properties attacked belonged to other minorities. The pogrom has been compared in some media to the Kristallnacht, the 1938 pogrom against Jews throughout Nazi Germany. Historian Alfred-Maurice de Zayas has written that in his view, despite the small number of deaths in the pogrom, the riots met the "intent to destroy in whole or in part" criterion of the Genocide Convention. Constantinople (modern Istanbul) was the capital of the Byzantine Empire until 1453, when the city was conquered by Ottoman forces. A large indigenous Greek community continued to live in the multi-ethnic Ottoman capital city. The city’s Greek population, particularly the Phanariotes, came to play a significant role in the social and economic life of the city and in the political and diplomatic life of the Islamic but multi-ethnic, multi-religious Ottoman Empire in general. This continued even after rebellions against Ottoman rule in Greece and the establishment of an independent Greek state in 1829, although during the Greek War of Independence massacres against local Greek communities occurred. A number of ethnic Armenians and Greeks, who served in the Ottoman Imperial diplomatic service and were even leading politicians in the 19th and early 20th century, were targeted. Following the collapse of the Ottoman Empire, the Greco-Turkish War (1919-1922), and the establishment of the Republic of Turkey, the population exchange agreement signed between Greece and Turkey resulted in the uprooting of all Greeks in modern Turkey (and Turks in Greece) from where many of them had lived for centuries. But due to the Greeks' strong emotional attachment to their first capital as well as the importance of the Ecumenical Patriarchate for Greek and worldwide orthodoxy, the Greek population of Istanbul was specifically exempted and allowed to stay in place. Nevertheless, this population began to decline, as evinced by demographic statistics. Punitive Turkish nationalist exclusivist measures, such as a 1932 parliamentary law, barred Greek citizens living in Turkey from a series of 30 trades and professions from tailoring and carpentry to medicine, law and real estate. The Varlık Vergisi tax imposed in 1942 also served to reduce the economic potential of Greek businesspeople in Turkey. In early 1950s, Turkey had close relations with Greece. In 1952, Paul of Greece became the first Greek Monarch to visit a Turkish Head of State, which was soon followed by Turkish president Celal Bayar's visit to Greece. However, the relations soured starting in 1953, when the armed struggle of the Greek Cypriots aiming Enosis, annexation of Cyprus by Greece, started. Soon after, Georgios Grivas, a retired general from Greek Army formed EOKA. This turn of events was politically exploited in Turkey by the Turkish nationalists of Kibris Türktür Cemiyeti (Cyprus is Turkish) organization, although EOKA had never targeted the Turkish Cypriot community before the anti-Greek pogrom events of September 1955. Greece appealed in 1954 to the United Nations to demand self-determination for Cyprus. Britain had the ruling mandate over the mostly ethnic Greek island, and wanted the Cyprus dispute to be resolved without being taken to the United Nations Security Council, where it could be problematically framed as an anti-colonialist struggle. To this end, Britain diplomatically encouraged Turkey to agitate Greece. The British ambassador to Greece also incited, saying in an August 1954 speech that Greco-Turkish ties were superficial, so nothing would be lost if, for example, something were to happen to Atatürk's house in Thessaloniki. More bluntly, an official of the Foreign Office said that some agitation would be much to Turkey's benefit. In any case, said parliamentarian John Strachey, Turkey had a large ethnic Greek minority in Istanbul as a card to play against Greece if it considered annexing an independent Cyprus to Greece. The concerns about the events in Cyprus led to the formation of a number of nationalist student and irredentist organizations in İstanbul, such as the National Federation of Turkish Students (Turkish: Türkiye Milli Talebe Federasyonu), the National Union of Turkish Students, and Hikmet Bil's (editor of the major newspaper Hürriyet) "Cyprus is Turkish" Association (Turkish: Kıbrıs Türktür Cemiyeti), who had protested against the Greek minority and the Ecumenical Patriarchate. Neither the Patriarchate nor the Rum minority ever openly supported Turkish national interests when Turkey and Athens clashed over certain issues. In return, the great Turkish nation never raised its voice about this. But do the Phanar Patriarchate and our Rum citizens in Istanbul have special missions assigned by Greece in its plans to annex Cyprus? While Greece was crushing Turks in Western Thrace and was appropriating their properties by force, our Rum Turkish citizens lived as free as we do, sometimes even more comfortably. We think that these Rums, who choose to remain silent in our struggle with Greece, are clever enough not to fall into the trap of four or ﬁve provocateurs. Tercüman, Yeni Sabah, and Gece Postası followed suit. The "Cyprus is Turkish" Association (CTA) stepped up activities in the weeks leading up to the riots, increasing the number of branches from three in August to ten by the time the attacks took place. On September 4, Hikmet Bil ordered students at Taksim Square, the heart of the city, to burn Greek newspapers. The same day, Kamil Önal of the CTA—and the National Security Service—handed out to students twenty thousands banners emblazoned "Cyprus is Turkish". The intercommunal violence in Cyprus prompted Turkey to transmit a diplomatic note to United Kingdom. United Kingdom then invited Turkey and Greece to a conference in London, which started on August 26. The day before the Tripartite London Conference (29 August–7 September 1955) began, Prime Minister Menderes claimed that Greek Cypriots were planning a massacre of Turkish Cypriots. Seeing the opportunity to extricate Britain, Prime Minister Harold Macmillan advised the Turkish delegates that they should be stern. Foreign minister Fatin Rüştü Zorlu paid heed to Macmillan and launched a harsh opening salvo, stating that Turkey would reconsider its commitment to the Treaty of Lausanne unless Greece reconsidered its position on Cyprus. The Greek delegates, surprised by harshness of the speech, blamed the British. Deflecting domestic attention to Cyprus was politically convenient for the Menderes government, which was suffering from an ailing economy. Although a minority, the Greek population played a prominent role in the city’s business life, making it a convenient scapegoat during the economic crisis in the mid-50s which saw Turkey's economy contract (with an 11% GDP/capita decrease in 1954). The DP responded first with inflationary policies, then when that failed, with authoritarianism and populism. DP's policies also introduced rural-urban mobility, which exposed some of the rural population to the lifestyles of the urban minorities. The three chief destinations were the largest three cities: Istanbul, Ankara, and Izmir. Between 1945 and 1955, the population of Istanbul increased from 1 million to about 1.6 million. Many of these new residents found themselves in shantytowns (Turkish: gecekondus), and constituted a prime target for populist policies. Finally, the conference fell apart on 6 September, the first day the subject of Cyprus would be broached at the conference, when news broke of the bombing of the Turkish consulate (and birthplace of Atatürk) in Greece’s second-largest city, Thessaloniki. Main targets of the Istanbul riots. The 1961 Yassıada Trial after 1960 coup d'état accused Menderes and Foreign Minister Fatin Rüştü Zorlu of planning the riots. Though both of them rejected the claims, it is believed by scholars that Menderes assented to the organization of protests in İstanbul against the Greeks, but the extent of knowledge of Zorlu, who had been in London for the conference, is unclear. Interior minister Namık Gedik was also accused of involvement, though he was not tried as he committed suicide before the trials started. According to Zorlu's lawyer at the Yassiada trial, a mob of 300,000 was marshaled in a radius of 40 miles (60 km) around the city for the attacks. The role of National Security Service was not clarified at the trials, since the sole aim of the junta was to sentence the DP government. The trial revealed that the fuse for the consulate bomb was sent from Turkey to Thessaloniki on 3 September. During the Yassıada Trial it was claimed that a twenty-year-old university student named Oktay Engin was given the mission of installing the explosives, two sticks of gelignite, in the consulate's garden. The consul M. Ali Balin allegedly first pressured consulate employee Hasan Uçar, but Engin was brought in when Uçar resisted. Both of them were arrested after the attack. Engin was born in Komotini (Turkish: Gümülcine) to Faik Engin (a well-known parliamentarian in the late '40s; he was one of the three Turkish members of the Greek parliament between 1946-1950) and became one of the few Turkish students to graduate from the Greek gymnasium in those years. Turkish officials encouraged him to study law, offering him a scholarship, so that he could promote the interests of Turkish citizens in Greece. He thus entered Aristotle University of Thessaloniki in 1953. When he was in his second year, he was accused of incitement in the bombing incident. Engin said that he had been followed by Greek intelligence agents so closely from the start of his university education, that he could name one ("Triondafilos"). In his 2005 book, Speros Vryonis documents the direct role of the Demokrat Parti organization and government-controlled trade unions in amassing the rioters that swept Istanbul. Ten of Istanbul’s 18 branches of the "Cyprus is Turkish" Association were run by DP officials. This organization played a crucial role in inciting anti-Greek activities. Most of the rioters came from western Asia Minor. His case study of Eskişehir shows how the party there recruited 400 to 500 workers from local factories, who were carted by train with third class-tickets to Istanbul. These recruits were promised the equivalent of 6 USD, which was never paid. They were accompanied by Eskişehir police, who were charged with coordinating the destruction and looting once the contingent was broken up into groups of 20–30 men, and the leaders of the party branches. While the DP took the blame for the events, it was recently revealed that the riots were in actuality a product of the Turkey's Tactical Mobilization Group; a clandestine special forces unit. Four star general Sabri Yirmibeşoğlu, the right-hand man of General Kemal Yamak who led the Turkish outpost of Operation Gladio under the Tactical Mobilization Group (Turkish: Seferberlik Taktik Kurulu), proudly reminisced about his involvement in the riots, calling them "a magnificent organization". Before the 6 September, some of the buildings of the Greeks and other non-Muslim minorities are marked with cross signs in order to make the arson easier,. Municipal and government trucks were placed in strategic points all around the city to distribute the tools of destruction (shovels, pickaxes, crowbars, ramrods and petrol), while 4,000 taxis were requisitioned from the Drivers Association and Motor Vehicle Workers' Trade Union (Turkish: Şoförler Cemiyeti ve Motorlu Taşıt İşçileri Sendikası) to transport the perpetrators. In addition, flags had been prepared by the Textile Workers' Union (Turkish: Tekstil İşçileri Sendikası). According to a September 2005 episode of the weekly show Files on the Greek Mega Channel, the accompanying photographs were seen by Salonican photographer Yannis Kyriakidis on September 4 (two days before the actual bombing). The consul's wife had brought the film to the photo studio that belonged to Kyriakidis' father to be printed. The photographs were then photomontaged, according to the program. At 17:00, the riots started in Taksim Square, and rippled out during the evening through the old suburb of Beyoğlu (Pera), with smashing and looting of Greek commercial property, particularly along Yüksek Kaldırım street. 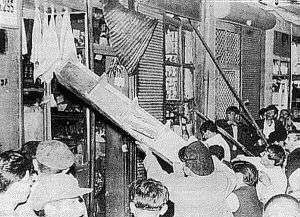 By six o'clock at night, many of the Greek shops on Istanbul's main shopping street, İstiklal Avenue, were ransacked. Many commercial streets were littered with merchandise and fittings torn out of Greek-owned businesses. According to the eyewitness account of a Greek dentist, the mob chanted "Death to the Giaours" (non-Turks), "Massacre the Greek traitors", "Down with Europe" and "Onward to Athens and Thessaloniki" as they attacked. Predictably, the situation came soon out of control and the mobs were shouting "First your property. Then your life". The riot died down by midnight with the intervention of the Turkish Army and declaration of martial law. The police, which supported the attacks by preparing and organizing the operations, was ordered to hold a passive stance and leave the mob to roam the streets of the city freely and commit atrocities against the civilian population. The Turkish militia and police that coordinated the attacks refrained from protecting the lives and properties of the victims. Their function was instead to preserve adjacent Turkish properties. However, there were a few cases where police officers prevented criminal activity. On the other hand, the fire brigade, whenever it reached a fire, claimed that it was unable to deal with it. A man who was fearful of being beaten, lynched or cut into pieces would imply and try to prove that he was both a Turk and a Muslim. "Pull it out and let us see," they would reply. The poor man would peel off his trousers and show his "Muslimness" and "Turkishness": And what was the proof? That he had been circumcised. If the man was circumcised, he was saved. If not, he was doomed. Indeed, having lied, he could not be saved from a beating. For one of those aggressive young men would draw his knife and circumcise him in the middle of the street and amid the chaos. A difference of two or three centimetres does not justify such a commotion. That night, many men shouting and screaming were Islamized forcefully by the cruel knife. Among those circumcised there was also a priest. The material damage was considerable, with damage to 5317 properties, almost all Greek-owned. Among these were 4214 homes, 1004 businesses, 73 churches, 2 monasteries, 1 synagogue, and 26 schools. Over 4,000 Greek-owned businesses, 110 hotels, 27 pharmacies, 23 schools, 21 factories, 73 Greek (and other Christian) churches and over a thousand Greek-owned homes were badly damaged or destroyed. The American consulate estimates that 59% of the businesses were Greek-owned, 17% were Armenian-owned, 12% were Jewish-owned, 10% were Muslim-owned; while 80% of the homes were Greek-owned, 9% were Armenian-owned, 3% were Jewish-owned, and 5% were Muslim-owned. Estimates of the economic cost of the damage vary from Turkish government's estimate of 69.5 million Turkish lira (equivalent to 24.8 million US$), the British diplomat estimates of 100 million GBP (about 200 million US$), the World Council of Churches’ estimate of 150 million USD, and the Greek government's estimate of 500 million USD. The Turkish government paid 60 million Turkish lira of restitution to those who registered their losses. Representatives of the World Council of Churches investigating the vandalized sarcophaguses of the deceased Ecumenical Patriarchs, in the Patriarchal cemetery in Balıklı. 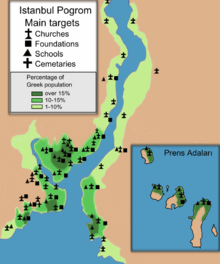 In addition to commercial targets, the mob clearly targeted property owned or administered by the Greek Orthodox Church. 73 churches and 23 schools were vandalized, burned or destroyed, as were 8 baptisteries [?] and 3 monasteries. This represented about 90 percent of the church property portfolio in the city. The ancient Byzantine church of Panagia in Belgradkapı was vandalised and burned down. The church at Yedikule was badly vandalised, as was the church of St. Constantine of Psammathos. At Zoodochos Pege church in Balıklı, the tombs of a number of ecumenical patriarchs were smashed open and desecrated. The abbot of the monastery, Bishop Gerasimos of Pamphilos, was severely beaten during the pogrom and died from his wounds some days later in Balıklı Hospital. In one church arson attack, Father Chrysanthos Mandas was burned alive. The Metropolitan of Liloupolis, Gennadios, was badly beaten and went mad. Elsewhere in the city, the Greek cemetery of Şişli, as well as the cemetery of the Patriarchates in Balıklı were targeted. Crosses and statues were vandalized, while sepulchers and burial vaults were opened and the remains of the dead were removed and dispersed by the fanatic mobs. Moreover, at Balıklı cemetery, the sarcophaguses of the Greek Orthodox Patriarchs were desecrated. The church of Yedikule was utterly smashed, and one priest was dragged from bed, the hair torn from his head and the beard literally torn from his chin. Another old Greek priest [Fr Mantas] in a house belonging to the church and who was too ill to be moved was left in bed, and the house was set on fire and he was burned alive. At the church of Yeniköy, a lovely spot on the edge of the Bosporus, a priest of 75 was taken out into the street, stripped of every stitch of clothing, tied behind a car and dragged through the streets. They tried to tear the hair of another priest, but failing that, they scalped him, as they did many others. One famous eyewitness was James Bond novelist Ian Fleming, who as an MI6 agent was present under the cover of the International Police Conference on 5 September (which he ditched in favor of covering the riots for The Sunday Times). Fleming's account was published on 11 September, bearing the title "The Great Riot of Istanbul". It has been said that Fleming may have been tipped off by Nâzim Kalkavan, the Istanbul station chief of the MI6, who appears in 1957's From Russia with Love as "Darko Kerim". According to Fleming's biographer, John Pearson, Kalkavan was rather like Kerim bey. A number of Turkish eyewitness accounts were published in 2008 by Ayşe Hür in an article that appeared in Taraf. There are accounts of protection offered to the minorities by their fellow citizens that were successful in fending off the mob. The most organized team rallied behind air force captain Reşat Mater. Mater happened to be off duty and visiting his home in Cevizli's Muhasebeciler Street, which was right next to the rally point, İstanbul Caddesi. Mater first hid some of his neighbors in his house, then he took to the street with his gun and his uniform. The boys in the neighborhood joined him, bringing domestic implements as substitute weapons. The mob passed by after seeing the barricade. Mater later rose all the way to Commander of the Air Force, making him third in the military line of command. His son Tayfun, who witnessed the pogrom, maintains ties with those who survived and fled to Greece. While the pogrom was predominantly an Istanbul affair, there were some outrages in other Turkish cities. On the morning of 7 September 1955 In İzmir, a mob overran the İzmir National Park, where an international exhibition was taking place, and burned the Greek pavilion. Moving next to the Church of Saint Fotini, built two years earlier to serve the needs of the NATO Regional Headquarters' Greek officers, the mob destroyed it completely. The homes of the few Greek families and officers were then looted. Considerable contemporary documentation showing the extent of the destruction is provided by the photographs taken by Demetrios Kaloumenos, then official photographer of the Ecumenical Patriarchate. Setting off just hours after the pogrom began, Kaloumenos set out with his camera to capture the damage and smuggled the film to Greece. Famous Turkish photojournalist of Armenian descent, Ara Güler, also took many photographs during the pogrom. After the events, 3,151 people were immediately arrested, the number of arrested later rose to 5,104. On 7 September, the Menderes government closed the "Cyprus is Turkish" Association (CTA) and arrested its executives. 34 trade unions were dissolved. The Minister of Internal Affairs Namık Gedik resigned on September 10. The investigation initially focused on the "Cyprus is Turkish" Association. CTA detainee, and spy, named Kamil Önal had one of his CTA associates burn an intelligence report originating from the National Security Service (NSS) that was at the CTA office. In addition, a member from the Kızıltoprak branch, Serafim Sağlamel, was found to be carrying an address list of non-Muslim citizens. However, on September 12, the government blamed Turkish Communists for the pogrom, arresting 45 "card-carrying communists" (including Aziz Nesin, Kemal Tahir, and İlhan Berktay). This type of "false flag" anti-Communist propaganda was a staple of the Counter-Guerrilla. When opposition leader İsmet İnönü delivered a speech criticizing the government for rounding up innocent people instead of the actual perpetrators, the communists were released in December 1955. An angry Menderes said that İnönü would not be forgiven for his speech, pardoning the communists. Oktay Engin and consulate employee Hasan Uçar were arrested on 18 September. Engin was first charged with executing the attack, but he presented an alibi so the charge was dropped to incitement. He was detained for nine months. Three months later, he escaped to Turkey before the Greek courts sentenced him to 3.5 years. In addition, Turkey refused Greece's extradition request. 87 CTA leaders were released in December 1955, while 17 were taken to court on 12 February 1956. The indictment initially blamed the CTA only for inciting some students to burn Greek newspapers in Taksim Square. In response to police chief Kemal Aygün's question about the Cominform's role in the affair, Şevki Mutlugil of the NSS cooked up a report, which concluded that the Comintern and Cominform had conspired to sabotage NATO. As proof, the prosecution submitted some brochures from the Communist Party of Turkey and a pair of letters from Nâzım Hikmet which called on the workers of Cyprus to stand against imperialism. To bolster the claims, the indictment claimed that NSS agent Kamil Önal had contacted the Comintern while on duty in Lebanon and defected, effectively exonerating the NSS. The remaining prisoners were released on 12 January 1957 for lack of evidence, by order of the Istanbul First Penal Court (Turkish: İstanbul 1. Ceza Mahkemesi). The chargé d’affaires at the British Embassy in Ankara, Michael Stewart, directly implicated Menderes’ Demokrat Parti in the execution of the attack. “There is fairly reliable evidence that local Demokrat Parti representatives were among the leaders of the rioting in various parts of Istanbul, notably in the Marmara islands, and it has been argued that only the Demokrat Parti had the political organisation in the country capable of demonstrations on the scale that occurred,” he reported, refusing to assign blame to the party as a whole or Menderes personally, however. The Foreign Office pointedly underscored the fact that British citizens were also victims of the attack. Although British ambassador to Ankara, Bowker, advised British Foreign Secretary Harold Macmillan that the United Kingdom should “court a sharp rebuff by admonishing Turkey”, only a note of distinctly mild disapproval was dispatched to Menderes. The context of the Cold War led Britain and the U.S. to absolve the Menderes government of the direct political blame that it was due. The efforts of Greece to internationalize the human rights violations through international organizations such as the UN and NATO found little sympathy. British NATO representative Cheetham deemed it “undesirable” to probe the pogrom. U.S. representative Edwin M. Martin thought the effect on the alliance was exaggerated, and the French, Belgians and Norwegians urged the Greeks to "let bygones be bygones". Greek population in Istanbul and percentages of the city population (1844-1997). The Turkish policies, after 1923, led virtually to the elimination of the Greek community. The compensation package allocated by the Turkish Assembly was only 60 million Turkish liras. While 12.7 million Turkish liras were given to churches for compensation out of 39 million Turkish liras claimed for damages, the rest of the 60 million Turkish liras was distributed among applicants. Tensions continued, and in 1958–1959, Turkish nationalist students embarked on a campaign encouraging a boycott against all Greek businesses. The task was completed eight years later in 1964 when the Ankara government reneged on the 1930 Greco-Turkish Ankara Convention, which established the right of Greek établis (Greeks who were born and lived in Istanbul but held Greek citizenship) to live and work in Turkey. As a result of tensions over the Cyprus issue, Turkey prohibited all commercial dealings by Greeks holding a Greek passport resulting in the deportation from Turkey of around 40,000 ethnic Greeks. They were allowed to take with them only 20 kg of their belongings and cash of 22 dollars. Moreover, the property they left was confiscated by the Turkish state ten years later. As a result of these policies, the Greek community of Istanbul shrank from 80,000 (or 100,000 by some accounts) persons in 1955 to only 48,000 in 1965. Today, the Greek community numbers about 2,500, mostly older, Greeks. After the military coup of 1960, Menderes and Zorlu were charged at the Yassiada Trial in 1960–61 with violating the constitution. The trial also made reference to the pogrom, for which they were blamed. The accused were denied fundamental rights regarding their defence, and they were found guilty and sentenced to death by hanging. The editor of the Istanbul Ekspres, Gökşin Sipahioğlu, went on to found Sipa Press; an international photo agency based in France. The owner, Mithat Perin, already a DP member, became a parliamentarian. The 6–7 September exhibition assault was a 2005 assault by Turkish nationalists on a photography exhibition dedicated to the fiftieth anniversary of the 1955 riots held in İstanbul. The exhibition itself was initially heralded as a major step forward for the development of democratic values in preparation of Turkey's admittance into the European Union. The military prosecutor at the time of the riots, vice admiral Fahri Çoker, kept documents and approximately 250 photographs of the events in order to educate posterity. He entrusted them to the Turkish Historical Society, stipulating that they be exhibited 25 years after his death. Two hours prior the opening of the exhibition, a nationalist lawyer and former president of Ülkü Ocakları Ramazan Kirik, Kemal Kerinçsiz, inspected the gallery and angrily walked out. Upon the opening of the exhibition, two people stood in front of the venue shouting and announcing that this exhibition was a misrepresentation of reality and that it wasn't considerate towards the sufferings of the Turkish people. Moments later, a 20–30 militant nationalist mob that belonged to the Ülkücüler nationalist organization raided and defaced the exhibit by hurling eggs at the photographs and trampling over them. Some of the photographs were thrown outside windows only to be stamped upon by other raiders. The raiders also distributed pamphlets and flyers that said, "Turkey is Turkish, will remain Turkish," "death to traitors," "love it or leave it," "Cyprus is Turkish and will remain Turkish," "why not the pictures from Cyprus but these," and "don't defend those who set fire to Atatürk's house." The raid was led by Kerinçsiz and nationalist lawyer Levent Temiz who have been taken into custody in 2008 for their suspected connection with Ergenekon. The assault was described by Feyyaz Yaman, the director of the gallery, as a repeat of the 1955 rioting in itself. The President of the Turkish Historical Society Orhan Silier condemned the attacks and stated that such acts of this event "will affect Turkey's image abroad." He also mentioned that "These protests show that groups based on the same violent methods, fear and paranoia, still exist." The incident was shown in Screamers, a 2006 documentary film about the Armenian Genocide. Oktay Engin continued his studies at Istanbul University's Faculty of Law. His school in Thessaloniki refused to share his transcript, but with only a certificate showing he had completed the first year, the university senate allowed Engin to continue from the second. After graduation, he started an internship in Cyprus. However, he was summoned by Orhan Öztırak, the minister of internal affairs, to monitor Greek radio stations. Next he placed first in a government exam that led to his to becoming the governor (kaymakam) of the most important district, Çankaya. One year later, the chief of the police force, Hayrettin Nakipoğlu, invited him to be the chair of the Political Affairs Branch (Turkish: Siyasi İşler Şube Müdürü). Under normal conditions, reaching such a position would require 15–20 years of work, starting from his position as a district governor. He remained in the police force thereafter, working his way up to the chief of the security department, and the deputy chief of the entire police force. Finally, in 1991 he was promoted to the governorship of Nevşehir Province. Engin rejects all allegations of culpability —indeed, of even being a spy or an acquaintance of General Yirmibeşoğlu. At present (2013), popular Turkish TV shows are alleged to portray the Greek people in a negative way. This resulted in complaints by representatives of the local Greek communities, since similar tendencies triggered the outbreak of anti-Greek pogroms and massive expulsions during the 1950s and 1960s. 1 2 Λιμπιτσιούνη, Ανθή Γ. "Το πλέγμα των ελληνοτουρκικών σχέσεων και η ελληνική μειονότητα στην Τουρκία, οι Έλληνες της Κωνσταντινούπολης της Ίμβρου και της Τενέδου" (PDF). University of Thessaloniki. p. 29. Retrieved 3 October 2011. 1 2 3 4 5 6 7 8 Speros Vryonis (1 January 2005). The Mechanism of Catastrophe: The Turkish Pogrom of September 6-7, 1955, and the Destruction of the Greek Community of Istanbul. greekworks.com. p. 225. ISBN 978-0-9747660-3-4. That night, many men, shouting and screaming, were Islamized forcefully by the cruel knife. Among those circumcised, there was also a priest. 1 2 Birand, Mehmet Ali. “The shame of Sept. 6–7 is always with us,” Turkish Daily News, 7 September 2005. 1 2 3 4 5 Güven, Dilek (2005-09-06). "6–7 Eylül Olayları (1)". Radikal (in Turkish). 1 2 de Zayas, Alfred (August 2007). "The Istanbul Pogrom of 6–7 September 1955 in the Light of International Law". Genocide Studies and Prevention. 2 (2): 137–54. ISSN 1911-0359. ↑ Yaman, Ilker. "The Istanbul Pogrom". We Love Istanbul. We Love Istanbul. ↑ "Foreign Ministry: 89,000 minorities live in Turkey". Today's Zaman. 2008-12-15. Retrieved 2008-12-15. 1 2 "From “Denying Human Rights and Ethnic Identity” series of Human Rights Watch" Human Rights Watch, 2 July 2006. 1 2 3 4 5 Ergil, Doğu. “Past as present”, Turkish Daily News 12 September 2005. 1 2 3 4 5 6 7 8 9 10 11 Kuyucu, Ali Tuna (2005). "Ethno-religious 'unmixing' of 'Turkey': 6–7 September riots as a case in Turkish nationalism". Nations and Nationalism. 11 (3): 361–380. doi:10.1111/j.1354-5078.2005.00209.x. 1 2 3 4 5 Holland, Robert. "The Struggle for Mastery, 4 October 1955–9 March 1956," Britain and the Revolt in Cyprus, 1954–59, Oxford: Clarendon Press, 1998, pp. 75–77. ↑ Gurel, Meltem, ed. (2015). Mid-Century Modernism in Turkey: Architecture Across Cultures in the 1950s And 1960s. Routledge. pp. 64–5. ISBN 1317616375. ↑ Maglinis, Ilias K. (28 June 2005). "Istanbul 1955: The anatomy of a pogrom". Kathimerini. The rally got out of control and resulted in a «Kristallnacht» against Greeks in Istanbul. ↑ Erdemir, Aykan (7 September 2016). "The Turkish Kristallnacht". Politico Europe. ↑ Zeynalov, Mahir (5 September 2016). "Mahir Zeynalov on Twitter". Tomorrow is the 61st anniversary of Turkey's own Kristallnacht, in which Greeks, Armenians and Jews were attacked and lynched. ↑ Ferentinou, Ariana (2005-09-19). "Sept. 6-7 in the Greek media - Part II". Turkish Daily News. Retrieved 2008-10-26. 1 2 3 4 5 Güven, Dilek (2005-09-07). "6-7 Eylül Olayları (2)". Radikal (in Turkish). Retrieved 2008-12-09. 1 2 3 4 5 6 7 8 9 10 11 Hür, Ayşe (2008-09-07). "6-7 Eylül'de devletin 'muhteşem örgütlenmesi'". Taraf (in Turkish). Retrieved 2008-09-21. 1 2 3 4 5 6 Güven, Dilek (2005-09-08). "6-7 Eylül Olayları (3)". Radikal (in Turkish). Retrieved 2008-12-09. 1 2 3 Kıvanç, Taha (2005-09-08). "6-7 Eylül'de ne oldu? (2)". Yeni Şafak (in Turkish). Retrieved 2008-12-10. 1 2 Ferentinou, Ariana (2005-09-12). "Sept. 6-7, 1955, in Greek Media". Turkish Daily News. Retrieved 2008-09-21. 1 2 Aktar, Ayhan (2005-09-06). "Ellerinde sopalarla Beyoğlu'na girdiler". Sabah (in Turkish). Retrieved 2008-12-10. 1 2 3 4 Gungor, Nasuhi (2001-01-21). "Selanik'e düşen bomba". Yeni Şafak (in Turkish). Retrieved 2008-10-26. 1 2 Mercan, Faruk (2003-09-08). "Bombacı da, MIT elemanı da değildim". Aksiyon (in Turkish). 457. Archived from the original on December 23, 2004. Retrieved 2008-09-21. ↑ Dilek Güven, Cumhuriyet Dönemi Azınlık Politikaları Bağlamında 6-7 Eylül Olayları, quoted in "20-30 kişilik organize birlikler". Sabah (in Turkish). 2005-09-06. Retrieved 2008-12-10. ↑ Dündar, Can (2007-04-01). "Özel Harp'çinin tırmanış öyküsü". Milliyet (in Turkish). Retrieved 2008-09-21. ↑ Ergil, Doğu (2008-09-17). "The dark side of nationalism: Sept. 6-7 incident". Today's Zaman. Retrieved 2008-09-21. Archived November 23, 2008, at the Wayback Machine. ↑ "Utanç Günü" "Archived copy". Archived from the original on 2012-04-15. Retrieved 2011-09-09. ↑ Gonullu, Tayfun (2000-07-01). "6-7 Eylül üstüme kaldı". Sabah (in Turkish). Retrieved 2008-12-10. 1 2 3 4 5 de Zayas, Alfred. "International Law and the Istanbul Pogrom" (PDF). Retrieved 4 October 2011. ↑ Λιμπιτσιούνη, Ανθή Γ. "Το πλέγμα των ελληνοτουρκικών σχέσεων και η ελληνική μειονότητα στην Τουρκία, οι Έλληνες της Κωνσταντινούπολης της Ίμβρου και της Τενέδου" (PDF). University of Thessaloniki. pp. 22, 24. Retrieved 3 October 2011. ↑ "A crisis struck at the end of 1955 as political and economic restlessness culminated in the riots of September 6 in Istanbul and Izmir (ostensibly induced by the issue of Cyprus) and a subsequent political shake-up. Contributing reasons for the violence: (1) use of the Greek Orthodox Church as a political instrument by the Greek government, thus sparking latent Moslem-Christian hostilities (which were laid on top of latent Greek-Turkish national hostility); (2) the presence in Istanbul of a large, floating, unemployed, male population of village origin which sought economic gain from looting; (3) popular identification of certain Istanbul merchants of Greek ethnic extraction with hoarding, speculation, and unsavory wealth; (4) deliberate stimulation and organization of the crowds to violent ends by an unknown group. (Communists? Doubtful, none were arrested. Opposition politicians? Equally doubtful; even the government made no such charge. Prime Minister Menderes? Doubtful; the riot ran contrary to every conceivable interest of his, A group of second echelon Democrats seeking to unseat Menderes? Somewhat more likely; an effort within the party was made in December. Religious and racial fanatics? Equally likely. Possibly a combination of the last two constituted the guilty parties. In such event, criminal convictions may have been avoided because those guilty were too closely identified with the Prime Minister. An outstanding feature of the Istanbul riot: no one was killed.) In July 1961, both Menderes and Bayar were found guilty by a revolutionary tribunal of inciting the 1955 riot, but the evidence was not impressive. What was proved was that the government had planned a popular demonstration to support its position in Cyprus. A critic of the Menderes regime commented to the author in 1962 "It is now almost generally agreed that these riots were planned, organized, and started by Democratic leaders and local bosses, but developed into far beyond the original plan and intention." It seems to me most likely that the demonstration was deliberately incited to unintended violence by other parties, the identity of whom still remains undisclosed. Local authorities, knowing of the government-sponsored demonstration, apparently did not know how to respond to the violence during the first few destructive hours. But was no evidence to prove that Menderes deliberately planned the type of mass violence that in fact erupted. ", Richard D. Robinson, The First Turkish Republic: a case study in national development, Harvard University Press, 1965, p. 157. ↑ E. G. Vallianatos (Winter 2006). "The Mechanism of Catastrophe: The Turkish Pogrom of September 6-7, 1955, and the Destruction of the Greek Community of Istanbul (review)". Mediterranean Quarterly. 17 (1): 133–140. ↑ Syracuse journal of international law and commerce. 1989. p. 29. Retrieved 2 June 2013. ... its interest in Cyprus at the time of the tripartite conference, planned and organized riots against its Greek citizens and residents in Istanbul and Izmir. ... Greek priests were reported circumcised, scalped, burned in bed; Greek women raped. The Greek Consulate was destroyed in Izmir. Just nine out of eighty Greek Orthodox churches in Istanbul were left undesecrated; twenty-nine were demolished. ↑ Aziz Nesin, Salkım Salkım Asılacak Adamlar (1987) quoted in: (Vryonis, 2005, p.225), as quoted in: (Gilson, 2005). ↑ Turkish currency exchange rates 1923–1990 Archived February 12, 2007, at the Wayback Machine. ↑ Citizen's Association of Constantinople. The Struggle for Justice: 1923-1993. Citizen's Association of Constantinople, Imvros, Tenedos, Eastern Thrace of Thrace. p. 51. ↑ Vryonis, Speros (2000). The great catastrophes: Asia Minor/Smyrna--September 1922; Constantinople--September 6&7, 1955 : a lecture. Order of Saint Andrew the Apostle. p. 14. ...the central cemetery at Sisli and the cemetery of the Patriarchs at Balikli. The former sustained particularly extensive destruction. Crosses and statues were knocked down, sepulchers and vaults opened and the remains of the dead removed and dispersed. At Balıklı, the sarcophaguses of the Greek Orthodox Patriarchs were desecrated. 1 2 3 Vick, Karl. “In Turkey, a Clash of Nationalism and History”, Washington Post, 30 September 2005. ↑ Kaplan, Sefa (2001-09-06). "Nâzım Kalkavan, Ian Fleming'in roman kahramanı oldu". Hürriyet (in Turkish). Retrieved 2008-12-10. ↑ "James Bond 007". MI6. 2008-05-28. Retrieved 2008-12-10. In Turkey, Fleming met the Oxford alumnus Nâzım Kalkavan whom he took a great liking to and roamed the country with. Kalkavan gave Fleming the spirit and knowledge of his upcoming novel and the characterisation of Bond's Turkish ally: Darko Kerim. 1 2 Kilic, Ecevit (2008-09-07). "Rum komşularını yağmacılardan kurtaran Türk general". Sabah (in Turkish). Retrieved 2008-12-25. ↑ Koçoğlu, Yahya (2001). Azınlık Gençleri Anlatıyor. İstanbul: Metis Yayınları. pp. 25–31. ISBN 975-342-336-5. ↑ Kilic, Ecevit (2008-09-07). "Bombayı atan da vali oldu". Sabah (in Turkish). Retrieved 2008-12-25. ↑ Güven, Dilek (2005). Cumhuriyet Dönemi Azınlık Politikaları ve Stratejileri Bağlamında 6-7 Eylül Olayları. Tarih Vakfı Yurt Yayınları. pp. 36–49. ISBN 975-333-196-7. ↑ Sasanlar, Binnaz Tugba. "A Historical Panorama of an Istanbul Neighborhood: Cihancir from the Late Nineteenth Century to the 2000s" (PDF). Bogaziçi University. p. 94. Retrieved 9 November 2011. ↑ KAYA, Önder (9 January 2013). "İstanbul'da GÜRCÜ Cemaati ve Katolik Gürcü kilisesi". Şalom (in Turkish). Retrieved 25 April 2013. ↑ Gezgin, Ulas Basar (11 December 2007). "That Was When I realized I was Georgian!". Retrieved 25 April 2013. 1 2 3 4 5 6 Ergener, Balca (2009). "On the Exhibition "Incidents of September 6–7 on their Fiftieth Anniversary" and the Attack on the Exhibition" (PDF). Red Thread (1). Retrieved 22 February 2013. 1 2 Ozmen, Kemal (September 6, 2005). "Haberlere abone ol| Eski sayfalara git RSS 6-7 Eylül Sergisine Saldırdılar". Bianet (in Turkish). Istanbul. Retrieved 23 February 2013. ↑ AKGÜNEŞ, GÜRKAN. "6-7 Eylül Sergisi'ni ülkücüler bastı". Milliyet (in Turkish). Istanbul. Retrieved 23 February 2013. ↑ "6-7 Eylül sergisine saldırı". NTV-MSNBC (in Turkish). 2005-09-07. Retrieved 2008-11-25. 1 2 BÇ/EÜ (2008-09-18). "Eleven Taken Into Custody For Ergenekon Investigation". Bianet. Retrieved 2008-09-21. ↑ Şahin, Dilek Güven ; çeviren Bahar (2006). Cumhuriyet dönemi azınlık politikaları bağlamında :6-7 Eylül olayları = Nationalismus, sozialer wandel und minderheitten : die ausschreitungen gegen die nichtmuslime der Türkei (6-7 september 1955) (in Turkish) (4. baskı. ed.). İstanbul: İletişim yayınları. ISBN 9789750504365. Retrieved 23 February 2013. ↑ "Ergenekon davasında sıra Kemal Kerinçsiz'in". Radikal (in Turkish). 1 2 "Attack on Sept. 6–7 events photo exhibit condemned". Hurriyet. Istanbul. 2005-08-09. Retrieved 23 February 2013. ↑ Gungor, Nasuhi (2001-01-22). "Oktay Engin: Devletin ihmali var". Yeni Şafak (in Turkish). Retrieved 2008-10-26. ↑ "S.RES.160 A resolution marking the anniversary of the anti-Greek pogrom in Turkey, on September 6, 1955". 104th Congress, U.S. House of Representatives, Library of Congress. 1995-07-08. Retrieved 2011-09-06. ↑ Aslihan, Aydin. "Greek minorities in Turkey disturbed by negative profiling of Greeks in TV shows". todayszaman. Retrieved 8 January 2013. Alexandris, Alexis. The Greek Minority of Istanbul and Greek-Turkish Relations: 1918-1974. Athens: Center for Asia Minor Studies, 1983. Güllapoğlu, Fatih. Tanksız Topsuz Harekât: Psikolojik Harekat (The Tankless, Cannonless Operation), Tekin Yayinevi, 1991. ISBN 975-478-087-0. The "magnificent organization" quotes originates here, pg. 104. Güven, Dilek. Cumhuriyet Dönemi Azınlık Politikaları ve Stratejileri Bağlamında 6-7 Eylül Olayları, İletişim, 2006. ISBN 975-05-0436-4. Based on author's doctoral dissertation, Nationalismus, Sozialer Wandel und Minderheiten : Die Ausschreitungen gegen die Nichtmuslime der Turkei from Ruhr University Bochum. Wikimedia Commons has media related to September 1955 Istanbul riots. NTVMSNBC Istanbul Pogrom Picture Gallery A gallery of pictures taken during the pogrom in 1955. 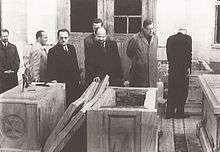 CNNTURK Istanbul Pogrom Picture Gallery Another gallery of pictures taken during pogrom in 1955. The gallery is titled as "Day of Shame for Turkey" by Turkish newschannel CNNTURK.